Simple water and ice science experiments! 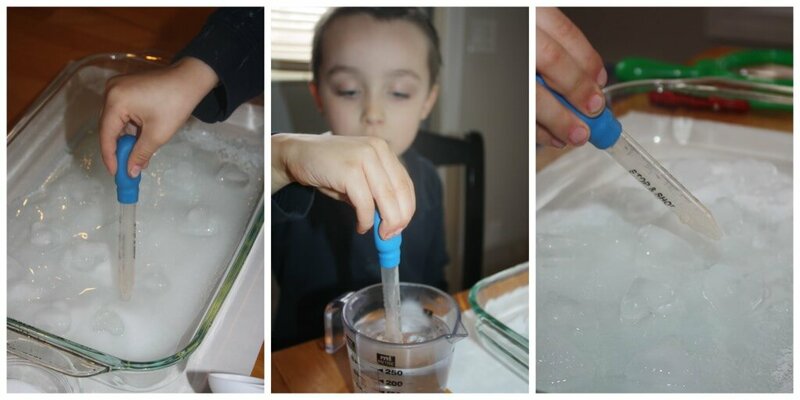 Valentine’s Day ice science experiments! Already we have done so many wonderful Valentine’s Day themed activities! 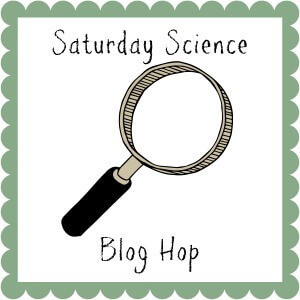 We had a ton of fun with these two simple ice science experiments. 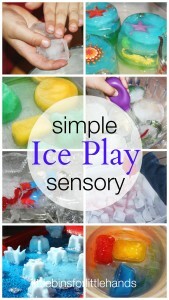 Ice and water are great materials to introduce preschool children to science. I made these two ice science experiments a little more interesting by using heart-shaped ice cubes and that adds a great novelty factor! The first ice science experiment shows ice melting. The second ice science experiment is ice racing on a variety of surfaces. 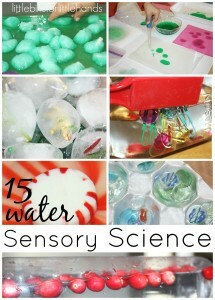 Sensory science experiments are prefect for young kids! 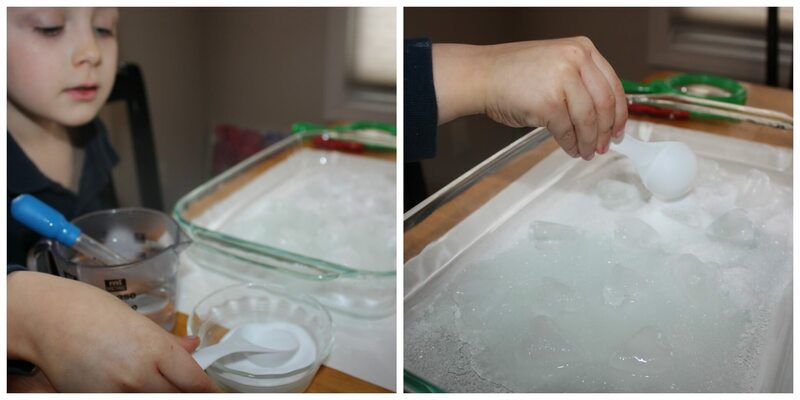 This Valentine’s Day ice science experiment showed how the salt and warm water melted the ice. The salt changed the temperature preventing it from refreezing and the hot water simply melted through the ice. We spent extra time with the flashlight and magnifying glass examining the ice along the way. We used water-color paint to really highlight the paths in the ice eaten away by the salt. Water and ice science experiments are some of his favorite ways to play, explore and discover. 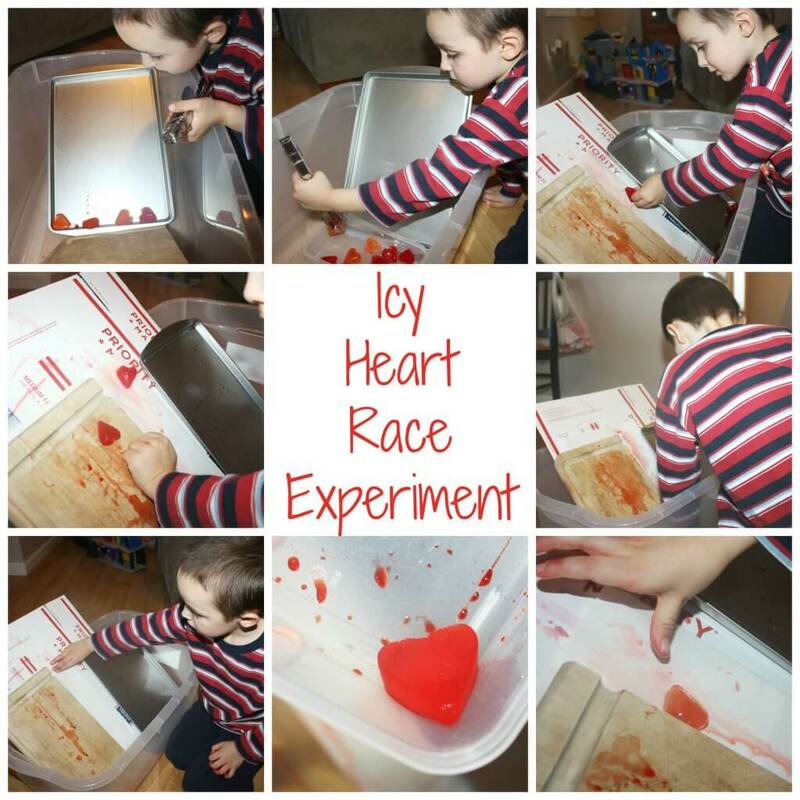 As a parent I even had a lot of fun with these Valentines Day ice science experiments! Table salt, epsom salts for a fun sensory base (dissolving experiment too! 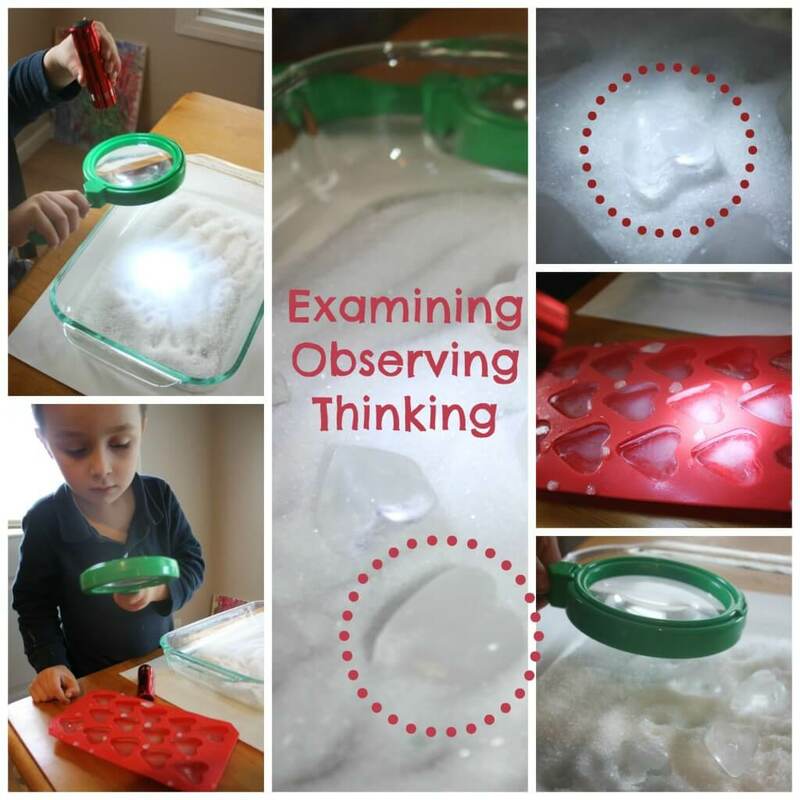 ), ice, water colors, magnifying glass, and flashlight for observing and examining! This was one of my favorite parts of our ice science experiment this time as we spent much longer than usual looking at things and talking about what we were doing. Adding the flashlight gave a fun way to look at the ice too. For this ice science experiment, I gave him a cup of hot water and a medicine eye dropper to squirt warm water on the ice. He also had a bowl full of table salt. The base of the dish was our epsom salts. He went back and forth with ice and water watching the ice melt and the base of the dish begin to dissolve and change. 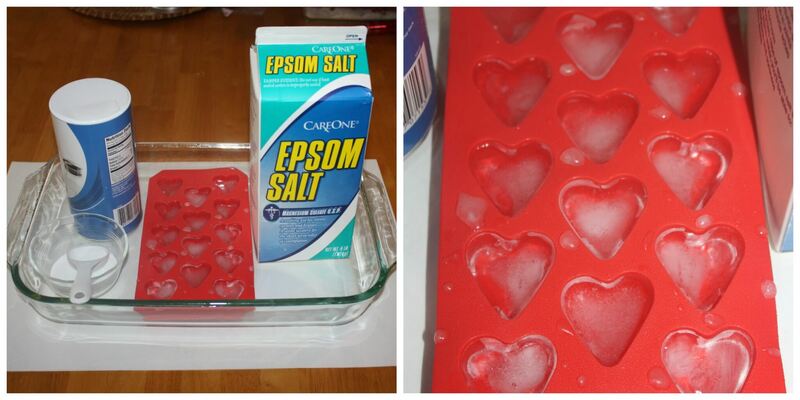 He used all the salt and two cups of water taking great care to work on each heart-shaped ice-cube. To really be able to observe what was happening between the salt and the ice, we added water colors to our ice science experiment. The colors soaked into the paths created by the ice. He thought it was very cool and again wanted to use the magnifying glass and flashlight for a closer look. We did journal this ice science experiment by making a watercolor painting afterward! 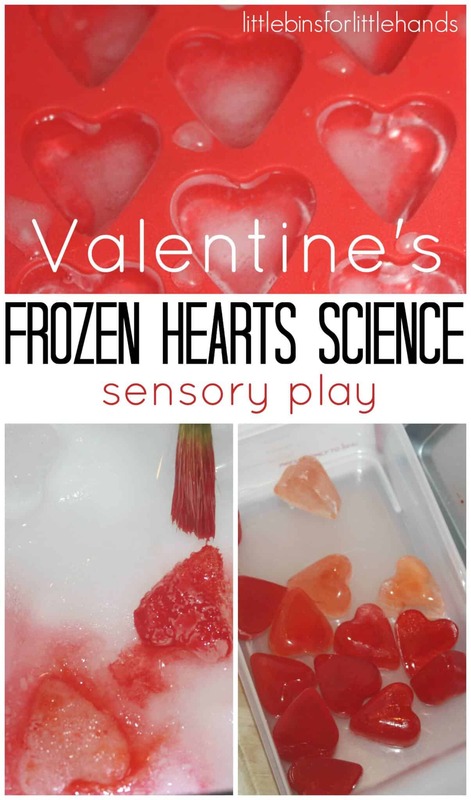 This Valentines Day ice science experiment also use ice but in a different way! We used the ice to test out which surfaces made a slippery slide for our ice cubes and which did not. 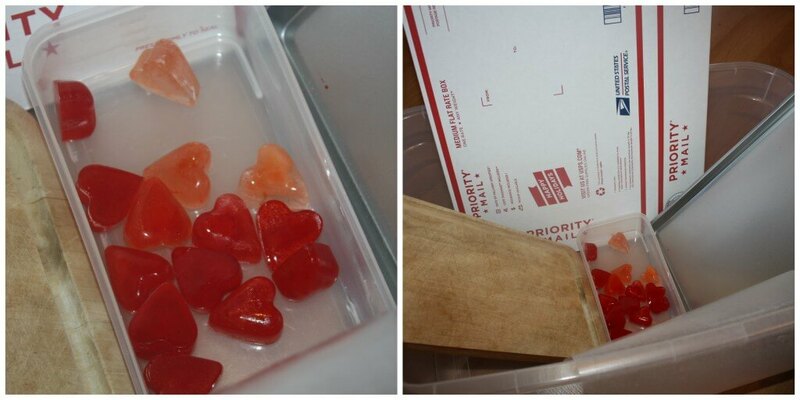 This Valentines Day science experiment needed a little time, patience and observation to see some neat things happening. We have already done a couple of fun water absorption and what does and does not absorb water experiments. This really helped him to understand what was happening as we tested the surfaces and watched the ice melt into water! We also learned a little about friction! I froze heart-shaped ice cubes. I also added red food coloring to so he could better see what was happening as the ice melted! A little messy and we both had some red stained hands for the day with this ice science experiment! I set out a large plastic bin and picked out a few materials to try out. An aluminum cookie sheet, a wooden cutting board, a piece of card board, wax paper and regular drawing paper. We set out racing the ice down the different surfaces. Different angles, different pairs of materials. At first we didn’t notice much difference. The ice was hard and slick and everything was about the same. However, as the ice melted, he began to notice the ice sticking to several of the surfaces or going slower than the other surfaces. We talked about the cold ice melting and some of the surfaces absorbing the water and slowing down the ice because of friction. The slick surfaces like the aluminum pan and the wax paper kept a slick surface while the others did not. (Postal box was a little more coated than I realized so regular cardboard would be better). Overall we enjoyed our ice science experiments very much. Preschool science includes so much hands on learning in a playful way! 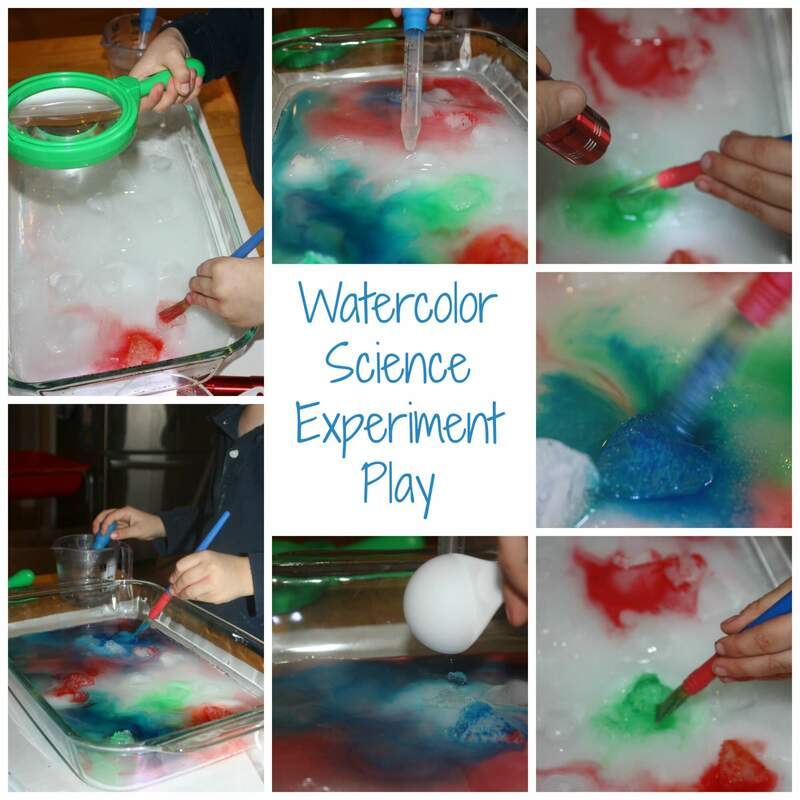 Water sensory science provides so many opportunities to play and learn at the same time! Simple Valentine’s ice science experiments are great fun with kids! Looks like Liam enjoyed these activities! 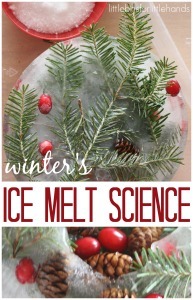 Great idea to test different surfaces with ice! I love the flashlight addition! Loving all these heart related activities. Great ideas. Thank you so much. I love holidays to mix it up a little! So for the melting ice experiment did you have one tray of just hot water and then one tray of cold water with Epsom salt and regular salt and your child was comparing how ice reacted in the two? Nope, everything on one tray and a side cup of warm water with dropper. The epsom salt was a base for the ice cubes and he also had a bowl of table salt to sprinkle more on top. He is still a bit to young for that type of experiment so we keep it a bit simpler right now. That would be a great experiment for the future!